First generation of our simulators was very funny for a lot of people, but as time went, we developed better new version. Possible UPGRADE of electronic controll unit + cockpit controller software => better motion + add a support of all games like for new generation (4x4) simulators. 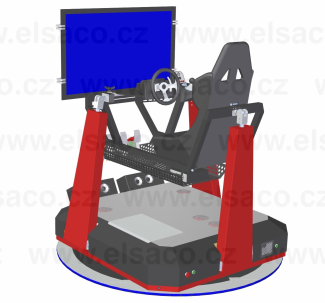 Basic car model with 3 moving legs, rotation base, 3 x 27" 2D LED display (TV), stereo sound system, professional racing seat with safety belts, professional racing steering wheel, 3 pedals (accelerate, brake and clutch) with a real braking characteristic, manual sequentional gear shifter or H-pattern gear shifter, handbrake, wind blower. 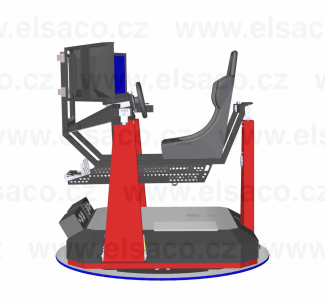 Basic car model with 3 moving legs, rotation base, one 47" 3D LED display (TV), stereo sound system, professional racing seat with safety belts, professional racing steering wheel, 3 pedals (accelerate, brake and clutch) with a real braking characteristic, manual sequentional gear shifter or H-pattern gear shifter, handbrake. Basic car model with 3 moving legs, rotation base, one 47" 2D LED display (TV), stereo sound system, professional racing seat with safety belts, professional racing steering wheel, 3 pedals (accelerate, brake and clutch) with a real braking characteristic, manual sequentional gear shifter or H-pattern gear shifter, handbrake.